My kids know that Mommy's brain is sick, and it has set them free. Shortly after my 6th child was born I fell into a dark and devastating depression. It affected every area of our lives. I stopped functioning. A good friend, wise and bold, pulled me aside one day and said "You have to tell your oldest daughters what is going on." She was right. My two oldest kids were 6 and 5. We made it age appropriate for them. "Mommy's brain is sick." and "Sometimes I get sad or angry or tired and it's not your fault." I let them ask questions and I answered them the best I could. "No, I don't know when I will get better." and "Yes, that's why I've been going to the doctor more." We cried together. Mourning together the chaos this sickness had brought to our lives. And then you know what happened? They skipped off to play, lighter and freer than ever. Talking to my children about mental illness lifted a weight from their tiny hearts. 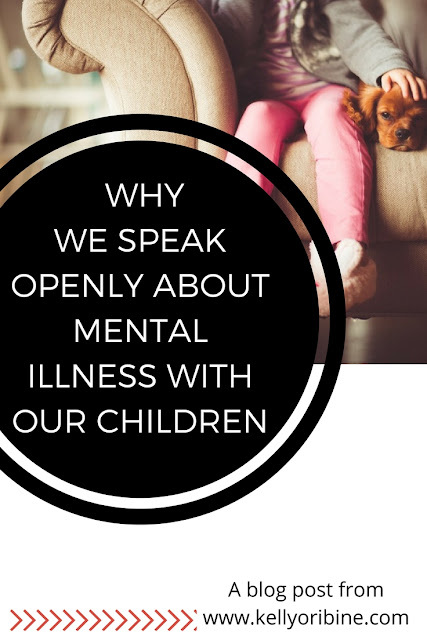 We talk about mental illness in our home. We talk about therapy and medication. We talk about my diagnoses and we acknowledge when things are rough. We don't share every detail with the kids, but we answer their questions and encourage them to talk to other safe adults in their lives about their feelings about my illnesses. And I am so glad we do. We talk to our kids about mental illness so that they will know it's not their fault. It's almost like a visible weight lifted the day I explained my illness to my kids. They know that my moods are not a reflection of them, that they are not responsible for making sure mommy is feeling okay. They are free to be kids. We talk to our kids about mental illness so that they can talk to other safe adults in their life about it. My children have shared in the past with teachers at school and friends' moms about my illness and how it affects them. They are free to share about their fears and hurts and frustrations in a healthy way. Talking about mental illness gives them the words to process what is going on at home. We talk to our kids about mental illness to reduce the shame and stigma. When we brush things under the rug and refuse to speak of them, we attach a shame to them, a "we don't talk about these things" sort of stigma. We give them so much power by refusing to speak of them. We have a saying in our home that "secrets keep us sick." By bringing my mental illnesses into the light, we send out that beacon that it is okay to discuss these things. It is okay to not be okay. We talk to our kids about mental illness because they may face these things one day. As much as I hope they won't, my kids could struggle with mental illness one day. And I want them to know that it's okay to talk about it, it's okay to call it by name and to seek help. I want them to access the services they need and seek support. I want to model that for them. I want my kids to know that in whatever they face, we talk about these things. There is nothing you can't discuss with those you love, that mental illness and addiction aren't shameful things we need to keep hidden, but very real sicknesses that require attention and help. I want my kids to know that there is no shame in needing help. I want to raise compassionate world changers who step boldly into difficult things and know that it's okay to discuss the things that break our hearts. Mental illness affects the whole family. And as much as we may try to shield our kids from our struggles, they know. They see and feel when something is wrong. Giving my kids the words to process what is happening at home has been powerful and freeing for all of us. Mommy's brain is sick. And that's okay. well I hadn't planned on crying today but that hit home in such a giant way. I don't have kids yet but I know that my mental health will affect the future spawnling(s) in all the ways my mothers affected me and her mothers affected her unless I take the time to do this. Thank you for this reminder that I never realized I needed. Thank you for this. I, too, am very open with my kids about my mental illness, and about their dad's struggle as we lost him to suicide late last year. I wonder how much better off we all would have been if mental illness was discussed and explained when we were children. This post really touched my heart. 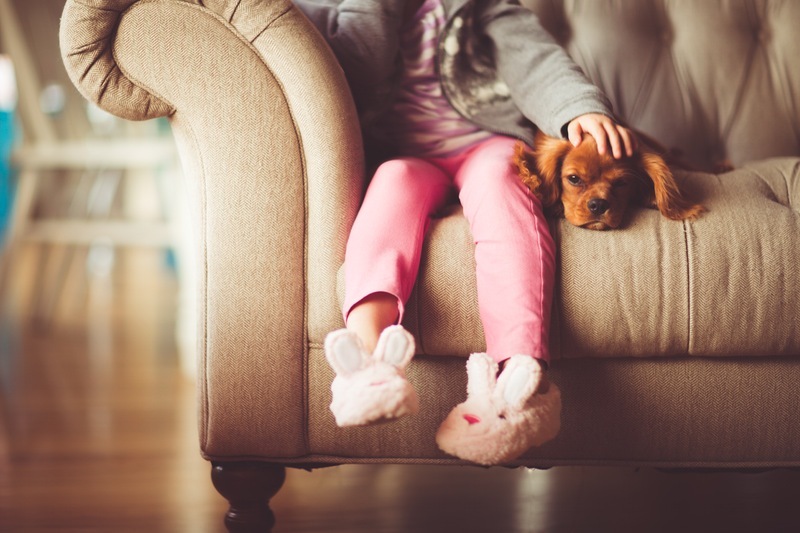 As a stay-at-home mom with five kids and multiple chronic illnesses as well as anxiety/OCD, I, like you, have seen firsthand how profoundly and deeply children internalize mommy' mental and physical health. I've had relatives say "You shouldn't burden them with knowing about your "issues"--let them just be kids!" It is SO frustrating to hear those words when you know that it is so much scarier for a kid to hear the generic "mommy's not feeling well again" or "mommy's just tired" over and over again (they feel so brushed aside and neglected when the adults that they trust to tell them the truth and keep them safe can't even look them in the eye when they say this or, if it is a relative who doesn't understand or sympathize with your conditions, you know the child can't miss the barely-suppressed eye roll or dramatic sigh!) than it is for us to have frequent, age-appropriate, frank discussions about my health and well-being, and also my treatments and upcoming doctor visits, allowing them to ask whatever questions they need to ask to feel secure, and not boring them or stressing them out by making it into a big deal. To my five kids, mommy has good days, medium days, and days where I can't get out of bed...and they know what my capabilities and limitations are on all of those types of days. They understand that my moods are never a direct result of anything that they did or failed to do, and most importantly they know that they can TRUST me and my husband to tell them the truth about what's going on and they feel secure knowing that no matter what mommy loves them more than anything and that I am ultimately going to be "ok". Thank you so so much for posting about this and sharing your journey online--there aren't nearly enough resources out there for moms living with mental illness/chronic illness! Keep it up! Kelly, thank you for this post - and for all your writing. I discovered your old blog (imperfecthousekeeping) earlier tonight, while researching how/if I can go paper-towel-free - of all things! I love how your writing and I've read many of your posts over the last couple hours. This one really hit home for me. While I don't have a family or children, I do struggle with mental illness and I believe education and accessibility to resources are incredibly important. Thank you for this post. Thank you for being open with your children, and with the world via your blog! It is important work that you are doing, and I'm not done reading.